One of the things about my son being 19 is that we can't take holidays for granted anymore. Though he still lives at home, between work, college and a social life, we have to schedule family traditions if we want him to be there. Tonight was one of those nights. 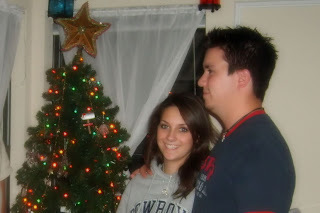 Two weeks ago I asked if he and Nichole wanted to help put up lights and decorate the tree. The thing about scheduling is that it actually gets to be an "event." Bethany and I baked gingerbread men, as Chase and John pulled everything down from the attic and worked on the lights. I cooked a huge pot of chili and made cornbread for dinner. We even had the cider that my sister served at Thanksgiving. The best part of the evening was when it was all done and we roasted marshmellows in the fireplace and simply hung out talking. Family moments with all of us are even more precious now that they don't simply happen randomly. We have to make them happen. Family moments like these are so precious as they grow older. My sister is coming for Christmas. This will be our first Christmas together with our parents in 10 years!